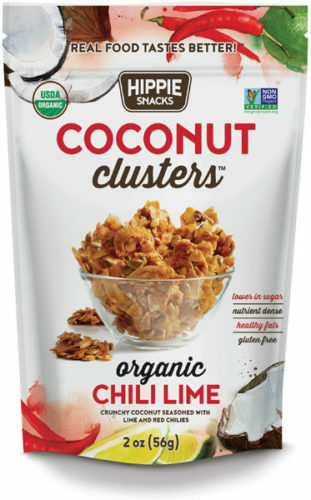 Coconut Clusters are the better-for-you snack made with organic coconut, seeds and spices. They are perfect for sharing or as a wholesome on-the-go snack. 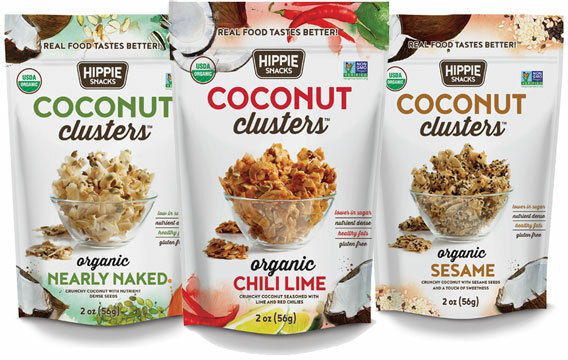 Choose Hippie Snack Coconut Clusters anytime you have a craving for something slightly soulful, sweet and savoury. Now that’s a real coconut snack! coconut*, pumpkin seeds*, sunflower seeds*, tapioca syrup*, water, cane sugar*, himalayan crystal salt. This product may contain sesame, milk, soy and tree nuts. 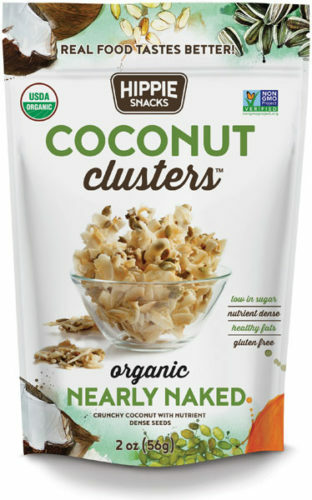 Toasted organic coconut mixed with nutrient-packed seeds. Seasoned with zesty lime and red chilies, they deliver unforgettable flavour and crunch. coconut*, pumpkin seeds*, sunflower seeds*, tapioca syrup*, water, coconut sugar*, himalayan crystal salt, lime juice concentrate*, paprika*, cayenne pepper*. 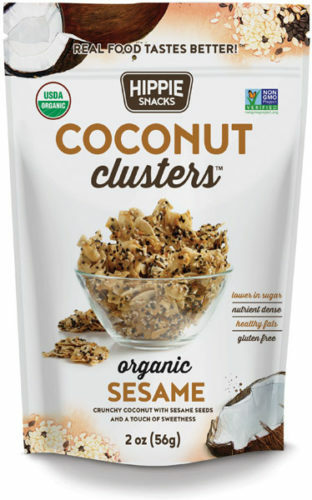 Toasted organic coconut mixed with nutrient-packed sesame seeds. With a touch of coconut sugar, they deliver a balanced sweet and sesame flavour with an irresistible crunch. coconut*, sesame seeds (white and black)*, coconut sugar*, tapioca syrup*, water, himalayan crystal salt. This product may contain milk, soy and tree nuts. get real. get hippie snacks.